It’s not about how far you run, it's about how fast you recover. It’s all very well to know how far you ran, cycled and swam. But the whole point of exercise is not just to clock the miles. It’s supposed to make you more fit. So, how do you know if all those sweaty miles are actually doing any good? One way is by measuring your heart rate recovery time. Fortunately, watchOS 4 provides a reliable way to see this data, and thus monitor changes in your fitness level. Here’s how you can use Apple Watch to keep your workout goals on track. You probably already know that the Heart Rate watch app provides stats like your current and resting heart rates. But what you might not know is that in watchOS 4, it also offers another important metric, provided you know where to look. Heart rate recovery, or HRR, is a measurement of how quickly your pulse returns to its resting rate when you finish a workout. This is one of the best indicators of your cardio fitness. Thanks to your Apple Watch, it’s now really easy to check. To view your HRR, you first need to log a workout with the built-in Workout app. When you tap on the “End” button to finish the workout, you get a summary screen. Scroll down to the Heart Rate section, tap on the small circular button with the heart icon, and you’ll be taken to the Heart Rate app, which shows a realtime display of your HRR. This test takes three minutes to complete. To get an accurate reading, avoid doing anything strenuous for these three minutes (that would mess with your results). For example, I wait until the HRR test finishes before climbing the endless flights of stairs up to my apartment after a run. If you don’t want to just stand there staring at your wrist, you can access the HRR again later. Just go to the Heart Rate app, scroll down past the other metrics, and you’ll see it highlighted in green at the bottom. At midnight, the app resets, making your HRR for the previous day no longer visible. However, you still can access it in the iPhone Activity app. Just open it, find the workout in the Workout tab, and wait for the Heart Rate to show (this sometimes takes a couple of seconds). Then, on the Heart Rate chart, swipe to the left to reveal the HRR chart. Why does heart rate recovery matter? How to view your heart rate recovery time. Workouts like walking, running, cycling and swimming are known as cardio exercise because they train your heart, making it stronger and more efficient — and reducing your risk of heart disease. When you start a new cardio training program, the initial benefits are easy to spot. For example, the more walking you do, the easier it gets, and the less likely you are to get out of breath as you quicken your pace. When you notice these changes, you know your fitness is improving. But as you continue your training, the changes become less obvious. That is when HRR gets interesting. The reason your HHR is so important is because the stronger and more efficient your cardiovascular system becomes, the more quickly it can get back to normal after you finish a workout. So if your HRR time gets shorter over time, that serves as a good indication that your training is having a positive effect on your fitness. Scroll to the bottom of the Heart Rate app to find your recovery time. On the HRR screen, you see a curved line plotted out in green dots, which in geeky terms looks like a power law graph. It shows your heart rate rapidly drops immediately after you finish exercising, but then the rate at which it slows gradually reduces. Hence the steep slope on the left, curving into a gently tilting plane on the right. It can take up to 24 hours for your heart rate to return completely back to normal after an intense workout. 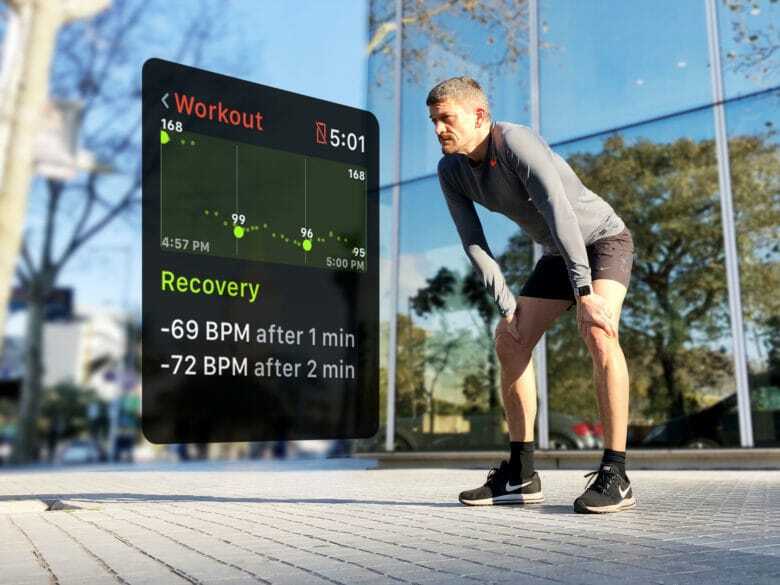 However, most of your recovery should take place within the first three minutes of finishing a workout, and that is the time period your Apple Watch displays. During this period, your Apple wearable highlights two key stats: your one-minute and two-minute recovery times. Both of these are important, but for slightly different reasons. Your one-minute recovery time provides a good indication of the health of your heart. A study published in The New England Journal of Medicine in 1999 found that a one-minute recovery of 12 beats per minute or less was abnormal, while 15 to 20 BPM was about average. Anything above that was a sign of good cardio health. If your Apple Watch says you have an abnormal one-minute recovery time, don’t panic. It could just be a glitch in your watch. Still, it’s definitely worth getting your doctor to check it out, just to be safe. The two-minute measurement is usually used as a test of fitness. A drop of 22 to 52 BPM is about normal. If your recovery is above 52 BPM, then go you! That’s a solid sign you’re in good shape. A bit confusingly, Apple displays your one-minute and two-minute recoveries slightly differently on Apple Watch versus iPhone. On the Apple Watch, it shows the difference, indicated with a minus sign. 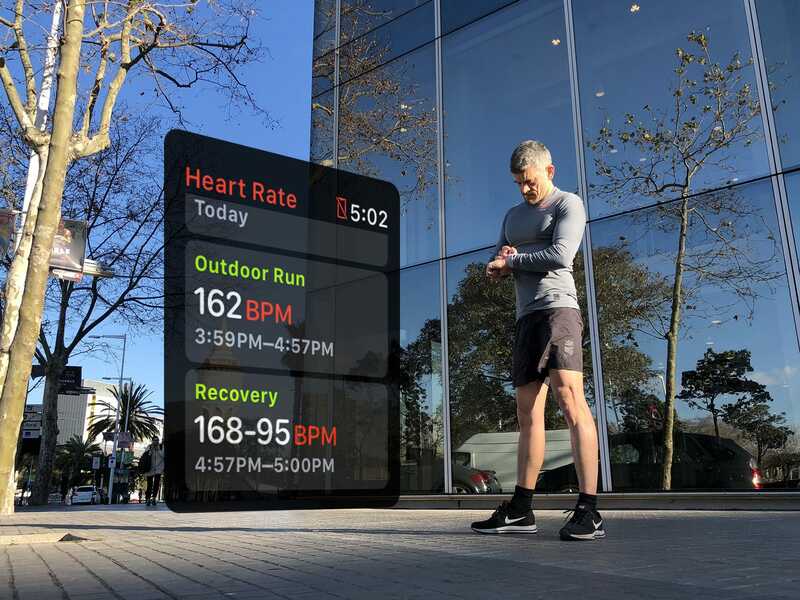 So, for example, if your heart rate was 168 BPM when you finished your workout, and then 99 BPM at the one-minute mark, the Apple Watch would show -69 (as in the screenshots above). But on the iPhone’s Activity app, it shows the actual BPM (99 BPM in the image above), so you must calculate the recovery time yourself. Hopefully Apple will change this discrepancy in iOS 12 and watchOS 5 to make the apps consistent. Ultimately, all these figures give you a guide to your cardiac health. Everybody is different. What is normal for one person might not be normal for someone else. What really counts is how your HRR changes over time. If you see that your HRR at one- and two-minute intervals is increasing, that is a very good indicator that your workouts are actually whipping you into shape. HRR is a very welcome addition to the fitness stats that Apple includes in its wearable. While it might look a little technical, it’s actually pretty easy to use once you get used to it. If you want to find out how fit you really are, just give it a try. Let us know what you discover!